For many woman, recession of the hairline due to hereditary hair loss or plastic surgery can be quite concerning. Using modern hair transplant methods, like follicular-unit micrografting, an artistic hair transplant surgeon can recreate a natural, living and growing hairline–thereby preserving or improving the aesthetic ‘frame of the face’ that the hairline provides. Unfortunately, many women (and men) undergoing browlift or facelift procedures underestimate the inevitable changes to their hairline these procedures will cause. Dr. Bauman takes a meticulous and artistic approach to female hairline restoration, using a ‘female-oriented’ approach to hairline lowering or hairline enhancement procedures. This female patient (see photo on left) had hairline lowering by Dr. Bauman using a session of follicular-unit micrografting. Artistic creation of the hairline in a wavy, randomized, natural pattern is critical to the final ‘look’ of the result. Notice that the hair angulation of the transplanted hair is natural and not distinguishable from the non-transplanted hair. 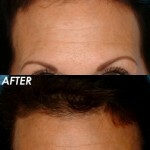 The “after” photo was taken approximately 10 months after a procedure of approximately 1200 follicular micrografts. Click on the photo for a larger version.